Chronic carbon monoxide poisoning occurs when repeated exposures to CO occur, without carbon monoxide being identified happens as the source of the illness. Typically chronic carbon monoxide poisoning is thought to involve long term exposure to low levels of carbon monoxide, but that is often not the case. Many times the significant acute exposures will occur at levels sufficient to cause illness, such as nausea, vomiting and headache. We have seen numerous cases where such levels reach well above 100 ppm repeatedly, yet the cause of the illness is not discovered. Since we started working in the field of brain damage in the early 1990’s, we have seen a greatly increased awareness of the dangers of repeated concussions. Now, injured athletes are required to go through return to play protocols, day after day until it is deemed safe for them to return. The concern is that the second and subsequent concussions will be exponentially more severe if the symptoms have not cleared before the subsequent trauma. Chronic carbon monoxide poisoning likely involves the same type of risk of permanent brain damage. While the brain is still vulnerable from a 100 ppm exposure on day one, another 100 ppm exposure may happen on day two. This could go on in varying degrees throughout an entire heating season. The results can be far greater than what might have happened in a single carbon monoxide exposure, even with higher ambient air levels. DNS, for Delayed Neurological Sequelae is discussed in depth elsewhere. Click here for more on DNS. But in essence, DNS involves a well recognized syndrome that occurs in as much as 40% of those who survive significant CO exposures. If the chronic carbon monoxide poisoning involves high enough ambient air levels to set off the chain of events of DNS, then the person exposed to chronic carbon monoxide exposure may be experiencing an acute exposure on a day that his or her body is also suffering from the effects of DNS. This combination of DNS and acute toxic levels of COHb is guaranteed to have a multiplier impact on the bodies organs. Brain damage likely goes from a 40% probability to nearly 100%. Carbon monoxide poisoning cases are built on two primary building blocks: proof of carbon monoxide in the ambient air and proof of carboxyhemoglobin in the blood sample of the survivors. Too often in the case of chronic carbon monoxide poisoning, one or both of these elements are missing. This means that the potential for severe permanent brain damage is off missed. Without a detailed evaluation of the time frames, reconstruction of the causes and quantities of carbon monoxide in the inside air, these cases may appear unprovable. Likewise, without a careful diagnostic workup, the impact of these repeat exposures on the brain may be overlooked. While such reconstruction of the ambient air issues are not always possible because of failure to preserve proof, if the ambient air levels can be reconstructed, then it may be possible to prove a case involving substantial economic and pain and suffering damages. If human beings breath air contaminated by carbon monoxide, that carbon monoxide will get into the blood stream. Almost all adults absorb carbon monoxide at very predictable rates. We also know if the carbon monoxide reaches a significant level, likely something around 10%, that as high as 40% of those poisoned will have permanent neuropsychiatric problems. That means brain damage. Thus, if we can reconstruct the ambient air levels and they are at levels that would result in carboxyhemoglobin (COHb) levels at or above 10%, the absence of an acute blood test may not derail a case. Chronic carbon monoxide poisoning can come from hot water heaters and furnaces when the exhaust is not direct vented or sealed. 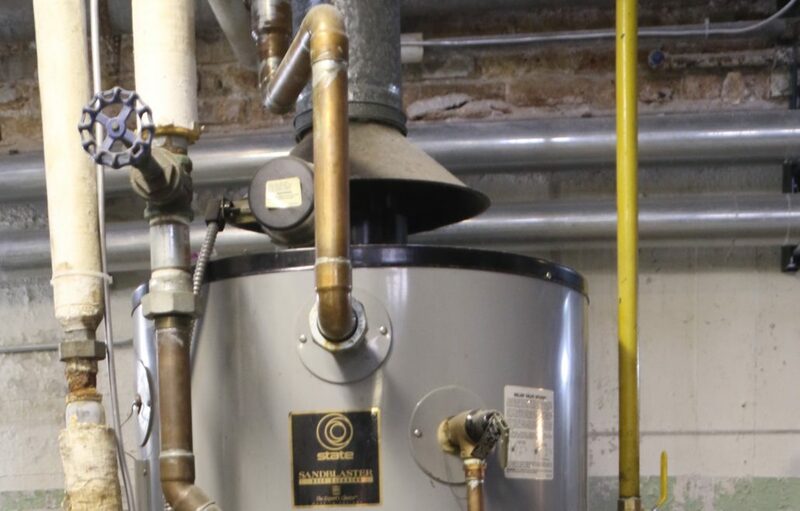 In the above photo, the hot water heater exhaust is supposed to flow as a result of gravity up into the hood over the top of the exhaust pipe. However, cross currents or other suction events can draw such exhaust out into room air. But the Carbon Monoxide Alarm Didn’t Go Off? Nothing herein should be taken to mean that we do not believe in carbon monoxide detectors. Carbon monoxide detectors save lives and reduce the amount of carbon monoxide that can get into the blood stream. But like seat belts don’t eliminate all brain damage in car wrecks, the presence of a carbon monoxide detector that didn’t go off doesn’t mean that toxic levels of carbon monoxide weren’t inhaled during a chronic carbon monoxide poisoning period. Most standard carbon monoxide detectors alarm only after continuous exposures that may be sufficient to have significantly raised COHb levels, before the alarm goes off. A properly working alarm in the precisely correct place can fail to warn of an event that can result in COHb levels of at least 7 in 8 hours. The standard alarm will only sound if there has been a continuous level of carbon monoxide in the indoor air for a set period of time. An ambient air level of 70 ppm can persist for 50 minutes before most alarms will sound. But with the improperly vented hot water heater or furnace, those levels are rarely continuous. If the level spikes as high as 200 for 15 minutes, then drops down to a lower level and then spikes again, it is possible for COHb levels to climb even higher without the alarm sounding. This is why we recommend that people replace their standard CO alarms with ones that will alarm at lower levels.